Roger Waters Is Not an Anti-Semite, But He Ruined "The Wall"
I'll take Roger Waters at his word that he's not an anti-Semite -- that his status among the upper echelon of the BDS (Boycott, Divestment and Sanctions) campaign against Israel, artists' division, and his placement of the star of David on an inflatable pig during his The Wall Live tour are his way of taking a stand against the mess in the West Bank and Gaza, not the inherent evil of all Jews. But there's no question his anti-Israel stance dulls the sharp message of the album he's touring the world performing, Pink Floyd's seminal concept album The Wall -- a musical masterpiece that resonates with listeners today as much as it did upon release in November 1979. Indeed, Waters's Middle East musings betray The Wall's critical ethos. 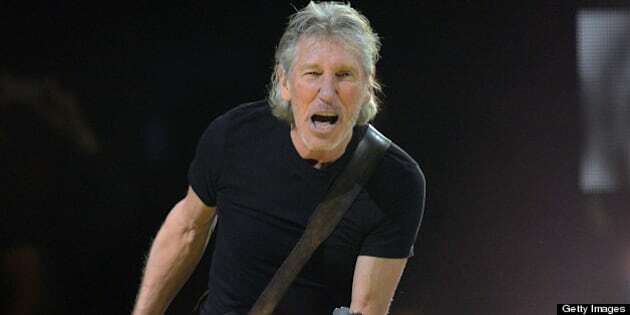 I'll take Roger Waters at his word that he's not an anti-Semite -- that his status among the upper echelon of the BDS (Boycott, Divestment and Sanctions) campaign against Israel, artists' division, and his placement of the star of David on an inflatable pig during his The Wall Live tour are his way of taking a stand against the mess in the West Bank and Gaza, not the inherent evil of all Jews. And while the Pink Floyd leader omits half of what's actually going on in the Israeli-Palestinian conflict when he speaks of the former's "Apartheid" regime -- namely, the part about Israel's previous offers of peace and virtually all land demanded by Palestinian leaders, not to mention the fact a terrorist group with the sole aim of destroying Israel runs half the Palestinian territory and will probably end up running the whole thing eventually -- well, it's the nature of argument to ignore inconvenient facts. But if Waters isn't an anti-Semite, there's no question his anti-Israel stance dulls the sharp message of the album he's touring the world performing, Pink Floyd's seminal concept album The Wall -- a musical masterpiece that resonates with listeners today as much as it did upon release in November 1979. Indeed, Waters's Middle East musings betray The Wall's critical ethos. The Wall is "about" a couple of things, but the main point is that in order to "tear down the wall" everything must be viewed with a critical eye and listened to with a critical ear. That's not necessarily a revelation in and of itself, but The Wall also suggests even criticism must be approached critically -- there's a lot of sarcasm to it. The album's famous phrase "We don't need no education" is an urgent reminder that organized anything imposes on impressionable young minds ideologies concocted by the rich and powerful to preserve the status quo -- and yet the children's chorus repeatedly intoning that line in unison implies the message has been corrupted. The point is to sing for yourself, not get a group together. Another example: The Wall's depressive protagonist, named "Pink," seeks to withdraw into himself from the outside world -- to become, as he calls it, "comfortably numb." And yet his growing isolation breeds a dream sequence in which he assumes the role of fascist dictator preaching to his minions and sentencing to isolation those -- including "queers" and Jews (as good a proof as any Waters isn't anti-Semitic) -- who don't fit the mould. The isolated has become the isolater. The Wall, in short, is as nuanced as art gets -- it's a profound assessment of the human condition, how confused we are and the pain that confusion can cause on a personal and global level. That's an important bit of real talk and it's sad to see Waters destroying The Wall's lesson on individuality. By promoting BDS, a cause that blatantly ignores one half of the Israel-Palestine conflict, he is turning his back on the path of careful criticism he once espoused. He's dumbing down the transcendent legacy of The Wall. The pig at the centre of the most recent criticism against Waters is a case in point. Waters rightly noted on Facebook that the star of David has lots of company on the pig -- "the Crucifix, the Crescent and Star, the Hammer and Sickle, the Shell Oil Logo and The McDonald's Sign, a Dollar Sign and a Mercedes sign" are also present. That dichotomy presents the real problem: To separate the world into good and evil, with nothing in between, is to build a wall of isolation and hatred. Waters concluded his Facebook post thusly: "... the pig in question represents evil, and more specifically the evil of errant government. We make a gift of this symbol of repression to the audience at the end of every show and the people always do the right thing. They destroy it." The destruction of the pig symbolizes a mass rejoinder to "errant government," yes, but it's also supposed to be a reminder of the ridiculousness of getting your messages from an inflated pig dangling above your head with fake graffiti on it. After all, pigs can't fly. They were both the message of The Wall, not the one-sided crap Waters is peddling to concertgoers and anti-Israel zealots. Read more things from me here. Thanks.